The Greeks did, however, develop one acoustical device of considerable value: the masks worn by actors. In addition to providing exaggerated facial expressions appropriate to the various roles, the masks served as megaphones that improved the mechanical coupling between the voice-generating mechanism and the surrounding air. 592 BC metal with curved arms. 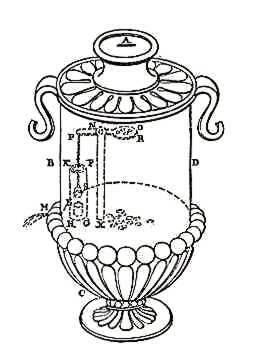 The hydrometer (also called an aerometer) an instrument used to determine the density of fluids is considered an invention of Hypatia. The oldest stories about an apparatus of this kind derive from around the year 400 (Hypatia in Alexandria), but they have apparently been forgotten. Armies developed anti-elephant weapons. In attack, the aim was to try to surround individual beasts, threatening them from the flank and rear. For this, special weapons might be devised, such as the scimitars and axes used by Alexander. Caesar used slingers who could aim at the mahout as well as the elephant. During the Sassanid Wars cataphracts (men armored with iron spikes which prevented the elephants from seizing them with their trunks) were used. The Romans were said to have deployed iron-pointed beams mounted on wagons against Pyrrhus. The ingenious Romans also used chariots drawn by armored horses, an arrow-firing catapult mounted on a vehicle drawn by horses or mules, and fire carts. Polyperchon used nail studded frames as moveable barriers at Megalopolis and Ptolemy laid an iron-spiked minefield at Gaza. Callimachus of Cyrene, a scholar and librarian at the Library of Alexandria, created about 245 BC for the first time a catalog of Greek literature covering 120000 books, called the Pinakes or Tables. Long before the Americans for centuries the ancient Greeks chewed mastic gum mastic or mastiche pronounced “mas-tee-ka”. This is the resin obtained from the bark of the mastic tree, a shrublike tree found mainly in Greece and Turkey. Grecian women especially favored chewing mastic gum to clean their teeth and sweeten their breath. Modern chewing gum had its beginning in the late 1860s when chicle was brought to the United States and tried as a chewing gum ingredient. Chicle comes from the milky juice of the sapodilla tree, which grows in the tropical rain forests of Central America. This tree is found mainly in those parts of Mexico, Guatemala and Belize that lie within the Yucatan Peninsula. The invention of formal city planning was attributed to Hippodamos of Miletus, who was born at the very end of the 6th century BC. Hippodamos helped to design the new harbor town of Piraeus, which served as a commercial port for Athens further inland. Hippodamus' name is frequently associated with other orthogonally planned towns, such as Olynthus, Priene, and Miletus. His direct involvement in these cases remains unproven, but his name remains permanently associated with this type of plan that we call Hippodamian. ..There is one mechanism described by Heron which was a most explicit anticipation of a device, which presumably soon went out of use, and which was not reinvented until towards the close of the nineteenth century. This was a device which has become familiar in recent times as the penny-in-the-slot machine. When towards the close of the nineteenth century some inventive craftsman hit upon the idea of an automatic machine to supply candy, a box of cigarettes, or a whiff of perfumery, he may or may not have borrowed his idea from the slot-machine of Hero; but in any event, instead of being an innovator he was really two thousand years behind the times, for the slot-machine of Hero is the precise prototype of these modern ones. The particular function which the mechanism of Hero was destined to fulfill was the distribution of a jet of water, presumably used for sacramental purposes, which was given out automatically when a five- drachma coin was dropped into the slot at the top of the machine. The internal mechanism of the machine was simple enough, consisting merely of a lever operating a valve which was opened by the weight of the coin dropping on the little shelf at the end of the lever, and which closed again when the coin slid off the shelf. 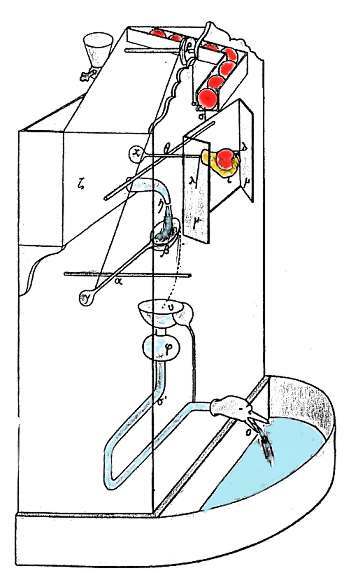 A similar but more complex automaton, the water spending device of Philon of Byzantium that also provides (here by a hand) a piece used like a soap (red spheres) for washing the hands (image colored version from Carra de Vaux ). 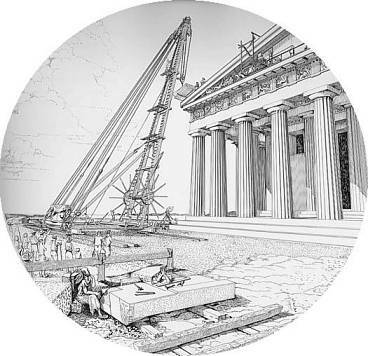 Archaeologists assume that cranes were used in Greece since 900 BC (although there is no direct proof). After a recent discovery of a 2.3 ton and 2900 years old sarcophagus in Corinth an archaeologist (Guy Sanders) said: "To lower the sarcophagus into place in a controlled movement ... requires some kind of temporary superstructure over the grounds so they can control the vertical movement of the stone”. Sophocles claimed dice were invented by Palamedes during the siege of Troy c. 1200 BC? Palamedes of Argos some say invented eleven letters of the alphabet or, as others say even sixteen. Palamedes is assumed to have discovered counting and coinage, weights and measures (attributed also to Hermes), military ranks , the lighthouse and the game of pessoi (a forerunner of chess). Palamedes was killed directly or indirect by Odysseus, the son of Laertes and Anticlea. Herodotus attributed the discover of the dice to the Lydians in the reign of Atys. 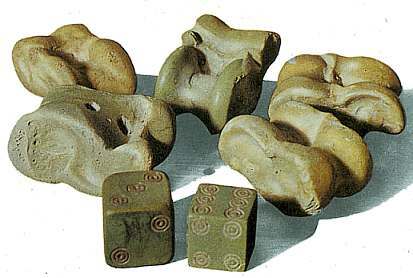 Probably dice were known and invented independently in various places back up to 6000 BC. Romans believed that Fortuna the daughter of Zeus decided about the outcome of a throw. Egyptians believed that their god Theuth invented dice and also numbers, arithmetic, geometry, astronomy, etc. Behind figures of heroic legend often stand real men.... As for Palamedes, the Greeks especially knew one thing about him: he was so clever that he devised a way to write down Greek speech.... In Palamedes we may have found the adapter's very name.... We cannot separated the recording of early hexametric poetry from Homer... Homer sang his song and the adapter took him down. From this momentous event came classical Greek civilization and its achievements. Pointing machine a device to copy a 2 or three dimensional object. According to ArtLex it was used by the Greeks and Roman sculptors to produce copies of art. A Pantogragh is a 2 dimensional version and was reinvented in the Renaissance. See Pointing machine and Pantograph . I don't know if such a device was used earlier. There is a reference “Did the Greeks use a pointing machine?” Bulletin Arch�ologique 30 (2003) 55-64 but I have no access to this journal to provide more details. Parchment, superior to papyrus because it can be printed on both sides and folded, was invented in Pergamon. Pliny quotes Varro's statement that skins preparation for writing was invented in Pergamon at the beginning of the second century BC. Thus, at least as far as the Hellenistic world is concerned, the transition from papyrus to parchment may have been a matter of necessity, resulting from the Egyptian embargo on papyrus. Papyrus was invented in Egypt Unlike papyrus, an imported product outside Egypt, the parchment was durable and inaccessible to forgery. In Egypt, where the low humidity and the relatively cost-saving production of papyrus outweighed these advantages, papyrus remained the substance of choice. Tthe methods of skin preparation evolved in the course of time. The skin was taken from animals such as sheep, goats, or cows. In order to get a durable product that is easy to write upon, the unnecessary hair and the fat were removed and the skin was smoothed. The usual method involved soaking the hide in water, to which were added calcium or flour, to cause fermentation, and salt. An addition of tannin, made of oak-gall, produced an irreversible chemical reaction that strengthened the product. The raw skins were treated in different processes which led to a variety of the final product and to the different names, such as diphtera, gewil, etc. A material called parchment, first mentioned in 301 BC, is assumed to have been prepared by the people of Pergamon. The preparation was without tanning, so that the skin dried while being stretched. The final product was thin and very delicate. Writing on animal skins is known even before 2750 BC in Egypt. 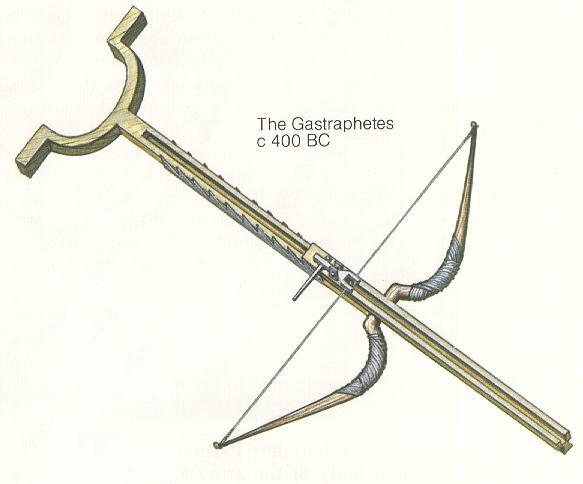 By Ctesibius around 250 BC, see Pump. By Ctesibius around 250 BC. First use of radiation weapon with burning mirrors. Focal property of the parabola recognized by about 250 BC. Problem of finding a mirror surface to reflect the sun’s rays to a point was solved by Dositheus and applied by Archimedes. 500-600 BC at Corinth for moving boats. The Library and the Mouseion in Alexandria is the first research center. The chambers of the great library were spacious and bright ... Across the hall, doctors carried out research in vast laboratories and dissecting rooms. In still another chamber, inventors gathered to assemble their new contraptions. Day and night the library pulsed with activity. At dusk, astronomers met on the rooftop observatory to map the constellations. At dawn, botanists could be seen ambling through terraced gardens where they observed new varieties of fruit trees and crops behind the library walls, animal keepers tended the world’s first known zoo. Open walkways, bordered by lovely fountains and lotus flowers, divided the courtyards from the library chambers. Along these walks stood the bibliothekai, the name given to the niches, or cubbyholes, filled with scrolls. The library stored 500,000 scrolls, and none of them ever left the library. Scholars sat on small stools near the niches to read, unrolling the papyrus sheets on their laps to view the columns of writing. Some of the scrolls were twenty feet long! The first known deflection of a river is found in Greek mythology when Hercules changed the flow of a river to clean the stables of Aygeias. Herodotus reports the deflection of the Halys (or Alios) river from Thales from Miletus for king Croesus of Lydia. When he (Croesus) reached the river Halys, he transported his army across it, as I maintain, by the bridges which exist there at the present day; but, according to the general belief of the Greeks, by the aid of Thales the Milesian. The tale is that Croesus was in doubt how he should get his army across, as the bridges were not made at that time, and that Thales, who happened to be in the camp, divided the stream and caused it to flow on both sides of the army instead of on the left only. This he effected thus:—Beginning some distance above the camp, he dug a deep channel, which he brought round in a semicircle, so that it might pass to rearward of the camp; and that thus the river, diverted from its natural course into the new channel at the point where this left the stream, might flow by the station of the army, and afterwards fall again into the ancient bed. In this way the river was split into two streams, which were both easily fordable. It is said by some that the water was entirely drained off from the natural bed of the river. But I am of a different opinion; for I do not see how, in that case, they could have crossed it on their return. The Lernean Hydra Labor is a case in point. It is not difficult to discover the refracted image of the multiple sources of a marshy area in the polykephalic form of the Hydra; a multitude of writhing snakes is enough to suggest a swamp, but the nature of her destruction is specified as agricultural and her blood is poisonous (Eur. Her. 422, 1188; Soph. Trach. 572 - 577), both qualities are apt metaphors for the stagnant and invasive waters of a swamp. Herakles cannot kill the monster with ordinary weapons but must resort to the use of firebrands, fire being the antithesis of water, and Apollodoros (Bibl. 2.5.2) preserves a version of the myth that Herakles could not kill one immortal head of the Hydra but had to bury it underground, a description which sounds like retraining of a watercourse. Later scholiasts , Lactantius and Servius, are explicit about the interpretation of the myth, that the Lernean Hydra was a swamp (Si veram quaeramus historiam, Lerna palus fuit), the waters of which Hercules dried up. The Lernean Hydra is characterized as the bane of Argos (Eur. Phoen. 1137) and it is likely that the marshy geology of the entire Argive plain contributed to the creation of a legendary swamp creature. New work in the Argive plain also provides the possibility that the myth has its origins in a geographical reality. Eberhardt Zangger (n�e Finke), in a geomorphological study of the plain, has been able to demonstrate that a large lagoon existed to the north of ancient Lerna, reaching its maximum size in the 5th millenium, almost completely disappearing by 1100 B.C, and swelling again between the Helllenistic and Roman periods, persisting in the area until recently This decrease in the level of Lake Lerna in the Late Bronze Age may have been natural or may have been due to the construction of a Mycenaean water control system. Mycenaean dikes and dam installations have been described by Jost Knauss in the Kopaic Basin, the Pheneatike, and Stymphalia and closer to Lerna, Zangger has recently published the dam at Tiryns which protected the lower town from flooding. If this decrease in the level of Lake Lerna was accompanied by a remission of deadly fevers and an increase in agricultural production, perhaps the myth of Herakles’ destruction of the Lernean Hydra was created to celebrate the draining of part of the swamp. It seems unlikely, however, that a gradual natural phenomenon occurring over hundreds or thousands of years would provide a marked enough change to be observed within one or two generations and immortalized in legend. However, a technological improvement in the drainage of such a waterlogged area would be noted and preserved in song. Curtius first postulated such an effort as the motivation for the myth and even recognized blocks and walls in the town of Myloi as components of a Mycenaean drainage canal system. Unfortunately, none of those features exists today. Another possible inspiration for the myth is the Mycenaean dam at Tiryns. The dam at Tiryns was probably constructed to prevent flooding in the lower town. Finke found an alluvial deposit to the north of the citadel which indicated a shift in the stream from its EBA position south of Tiryns. The dam diverted the stream to the south again, and alluvial deposits demonstrate its efficacy. The Tiryns dam is probably not the inspiration for the veiled reference to hydraulic efforts in the Lernean Hydra, but it may be one of many such Mycenaean water control installations that, when working together, improved the drainage conditions in the entire Argive Plain. A grandiose hydraulic project that would have improved the lives of many people is one worthy of assignment to Herakles. It is possible that Herakles swamp draining efforts preserve in mythological form the memory of actual Mycenaean hydraulic projects. In the Classical and Hellenistic periods, as the connection between pooled, stagnant water and fevers began to be realized, it may well be that Herakles became a symbol and patron deity of the eradication of the plagues and epidemics that swamps engender. The traces of his curative abilities in the Alexikakos epithet, healing springs and association with Asklepios may all stem from the realization of his mythic abilities in water control. Heron of Alexandria described a mechanism or apparatus that made use of the so called "sequence control" mechanism. This mechanism used drums in which pins and gears were mounted to control events that 'laid ahead'. Sequence control gives means to foretell the outcome of a sequence of events in advance, without influencing the outcome directly. Examples of sequence control are a music box with a drum on which pins are attached that strike against the teeth of a comb. Teeth that have predefined lengths and thus possess their own tone. By striking teeth in a predefined sequence a melody will sound. Sequence control is defined as a lower generation of computer programs. The operator feeds machines like that with certain limited input and lets the machine run on its own without external control for the outcome: actions to move mechanical contraptions, music or calculations. 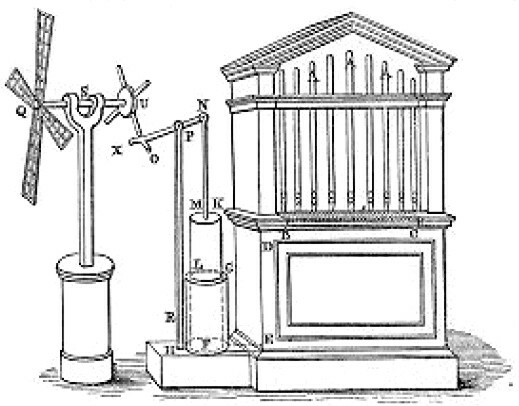 shock-absorber invented for Alexander's funeral carriage (Diodorus Siculus, XVIII, 26, 27, 28) a wheeled monument on which the body of the hero was laid, was pulled all the way to Alexandria via Memphis. Alexanders body was placed in a gold anthropoid sarcophagus which was then encased in a second gold casket and covered with a purple robe. Alexander's coffin was placed, together with his armor, in a gold carriage which had a vaulted roof supported by an Ionic peristyle. The decoration of the carriage was very rich and is described in great detail by Diodorus. 350 BC. Development of siege machines by Philip. Aineias Taktikos On the defence of a besieged city. See the Helepolis of Demetrius. invented by Philo of Byzantium ( 260-180 BC). It worked with steam and was used as an acustic signal emitter for lighthouses. Philo was one of the most important engineers of the Hellenistic period. He describe various devices that work with air or steam. (That shows that Heron's aeolipile is not the only device that uses steam). by Glaucus of Chios around 600 BC. Greek soap was manufactured from a combination of goat fat and ashes. Soap was discovered at Sappo Hill in Greece. The ancient Greeks traveled to this sacred place to give burnt offerings to the gods. They would sacrifice animals over an open fire and the grease or tallow would drip into the coals of the fire. Later, it would rain and the water would percolate through the ashes of the fire. This would result in the natural formation of lye which would act upon the fat remaining in the fire pit and would saponify this soap thus making natural soap. Soap is nothing more than fat which has been converted into soap through the chemical action of the lye (or sodium hydroxide) with the fat. The Scythians of Ukraine probably as early as the 7th century B.C. were using soap to wash their hair according to the Greek historian Herodotus. Another source is at 275 BC Theocritus Idyll 15 (smema). We also know that Ancient Greeks used the sap of a plant called saponaria. Heron, described in detail what is thought to be the first working steam engine, which was obviously not very efficient. He called it an aeolipile, or "wind ball". His design was a sealed caldron of water was placed over a heat source. As the water boiled, steam rose into the pipes and into the hollow sphere. The steam escaped from two bent outlet tubes on the ball, resulting in rotation of the ball. 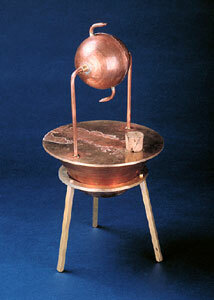 The aeolipile is the first known device that could transform steam into rotary motion. The principle he used in his design is similar to that of today's jet propulsion. The steam engine reappeared again only in 1698 when Thomas Savery invented a steam pump. 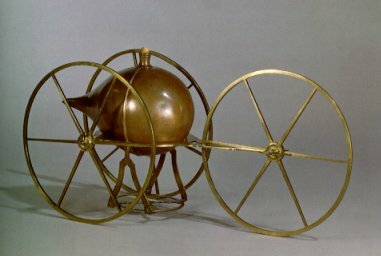 The first practical steam engine was the atmospheric machine of Thomas Newcomen in 1701. It was used to operate pumps on coal mines. In 1804, English inventor Richard Trevithick introduced the steam locomotive in Wales. In 1815, George Stephenson built the world's first workable steam locomotive. A jet propelled wagon utilizing the aeolipile appeared in early textbooks on the evolution of the horseless carriage. THIS IS A MUST READ!!!! Για το ατμοτηλεβόλο (ή ατμοπυροβόλο) οι μοναδικές ιστορικές μαρτυρίες που έχουμε προέρχονται από τον Ιταλό ποιητή Φραγκίσκο Πετράρχη (1304-1374), που μτλά γι’ αυτό στο έργο του De remediis utriusque fortunae και τον περίφημο μηχανικό και ζωγράφο Λεονάρντο ντα Βίντσι (1452-1519) που είχε πιθανότατα στη βιβλιοθήκη του σχετικό χειρόγραφο του Αρχιμήδη. Ο Ντα Βίντσι προχώρησε στο σχεδιασμό του οργάνου, αλλά όχι στην κατασκευή του ατμοτηλεβόλου, το οποίο ονόμασε �αρχιτρόνιτο� προς τιμήν του Αρχιμήδη. Μας παρέδωσε τρεις απεικονίσεις του οργάνου πάνω στις οποίες στηρίχθηκε ο Ι. Σακάς για την ανακατασκευή του. Το ατμοτηλεβόλο του Ι. Σακά ήταν μοντέλο σε αναλογία 1/5 και στις 12 Μαΐου 1981 έγινε δημόσια επίδειξη κατά την οποία πραγματοποιήθηκαν βολές που έφτασαν σε μήκος τα 50 μέτρα. Το πείραμα έλαβε χώρα σε ακάλυπτη περιοχή στα Άνω Βριλήσσια της Αττικής παρουσία πολλών αντιπροσώπων του ελληνικού και ξένου Τύπου. Ένας από αυτούς, ο Πέτρος Μακρής, σε κείμενο του στην εφημερίδα �Ελευθεροτυπία�, της 15ης Μαΐου 1981, μεταξύ άλλων έγγραφε και τα εξής: �Η πολεμική μηχανή του Σακά είναι κατά πέντε φορές μικρότερη από εκείνη του Αρχιμήδη και είναι κατασκευασμένη με τα ίδια υλικά που χρησιμοποίησε ο μεγαλύτερος μηχανικός της αρχαίας Ελλάδος και ίσως του κόσμου, μέχρι σήμερα. Δηλαδή αποτελείται από ξύλινη κάνη, λέβητα νερού, χάλκινο κύλινδρο και σφαιρικά βλήματα... Ο Έλληνας μηχανικός άναψε φωτιά με ξερόκλαδα κάτω από το λέβητα του τηλεβόλου. Μετά από ένα γερό ζέσταμα του καζανιού γέμισε από εμπρός την κάνη του τηλεβόλου με τσιμέντινη σφαιρική μπάλα, στο μέγεθος μπάλας του τένις. Για να δημιουργηθεί πίεση αρκετών ατμοσφαιρών -σύμφωνα πάντοτε με το σχέδιο του Αρχιμήδη- ο κ. Σακάς εμπόδισε την έξοδο της σφαίρας με μικρό ξύλινο δοκάρι. Μόλις η επιφάνεια του λέβητα θερμάνθηκε στους 400 βαθμούς Κελσίου, ο κ. Σακάς έριξε σ’ ένα μικρό σωλήνα του τηλεβόλου μόνο 6 γραμμάρια νερού που έγινε στα 10 δευτερόλεπτα ατμός, ο οποίος με χειροκίνητη βαλβίδα διοχετεύθηκε στην κάννη. Η πίεση αυτή του ατμού ήταν αρκετή για να σπάσει το δοκάρι που έφραζε την έξοδο της κάνης και να πετάξει την μπάλα σε απόσταση 50 μέτρων�. Ancient Greek Alphabetic script adapted from Phoenician , 800 BC ? (some do not agree with this idea. ). A very important invention of the Greeks: The vowels (α , ε , η, ω ...). The Greek alphabet the first which used symbols for consonants and vowels. Before it was like writing “rd ths txt” instead “read this text”. Although some believe that maps were produced first around 6200 BC the first reference in Western literature of a map is from Herodotus account of the interview between Aristagorous, tyrant of Miletus, and the Spartans. The first Greek assumed to have produced maps was Anaximander (c. 610-546 BC). Dikaiarch of Messina (350-290 BC) a Greek geographer introduces to the map making world the notion of latitude and longitude. Later Eratosthenes and Strabo produced the first Maps of the entire known World. Claudius Ptolemy who lived and worked in Alexandria, Egypt during the first half of the second century AD created a system of geographical knowledge (Guide to Geography c. 140 AD) that dominated the field for a millennium and a half. He produced a world map with 26 regional maps and 67 local maps (all lost). Eight books in all. He used a regular grid of parallels and meridians, i.e. a coordinate system (before Descartes). Supported corrections of scale distortions in other maps, i.e. introduced map projections. Mentions use of gnomon and astrolabe for pole star & sun. Included a gazeteer (data bank) of about 8000 localities with their supposed longitudes and latitudes, and even appropriate captions for the maps. By 1740, only 116 places known. "The Greeks of Alexandria knew that air expanded as it was heated, and Philo of Byzantium, who was alive at the time of the birth of Christ, made a 'thermoscope' that must have been very like Galileo's air thermometer. But it was Galileo who, in 1592, was the first to put a scale besie the tube. This at once converted the device into a scientific instrument and made it possible to distinguish between temperature and heat. The study of heat as a form of energy depended on this distinction. Central heating appears to have been invented in ancient Greece, but it was the Romans who became the supreme heating engineers of the ancient world with their hypocaust system. Central heating was adopted for use again in the early 19th century when the Industrial Revolution caused an increase in the size of buildings for industry, residential use, and services. Hoops were used in Egypt around 1000 BC from grape leaves and were propelled around the ground with sticks. The ancient Greeks recommended their use for losing weight. Hooping was used in the 14th century in England but the physicians blamed it for heart attacks and back dislocations. The word "hula" comes from Hawaii around 1800.
this is reallly good thanx for posting, now when my "friend" says that greeks have no culture and have never done anything good for society i can add these to the list. lol shes crazy xazi engleza. Has anyone paid attention to how speakers look? well thats what speakers were designed upon because of its round and aqoustics , because in the theatre ancient times it basically if you sit all the way upback you can hear everything , so basic projects and inventions have gone along way into moden day society. What did you think i was trying to say??? What is seen here is a diamond consisting of two isosceles triangles formed if we connect the sites of the Ancient Greek temples in Athens (Parthenon), Cape Sounion (Poseidon�s temple), Afaia Aigina temple in the island of Aigina (Athena) and Megara. The early Greeks, in their speculation and theorizing, ranged from the flat disc advocated by Homer to Pythagoras' spherical figure-an idea supported one hundred years later by Aristotle. Pythagoras was a mathematician and to him the most perfect figure was a sphere. He reasoned that the gods would create a perfect figure and therefore the earth was created to be spherical in shape. Anaximenes, an early Greek scientist, believed strongly that the earth was rectangular in shape. Since the spherical shape was the most widely supported during the Greek Era, efforts to determine its size followed. Plato determined the circumference of the earth to be 40,000 miles while Archimedes estimated 30,000 miles. Plato's figure was a guess and Archimedes' a more conservative approximation. Meanwhile, in Egypt, a Greek scholar and philosopher, Eratosthenes, set out to make more explicit measurements. He had observed that on the day of the summer solstice, the midday sun shone to the bottom of a well in the town of Syene (Aswan). Figure 1. At the same time, he observed the sun was not directly overhead at Alexandria; instead, it cast a shadow with the vertical equal to 1/50th of a circle (7� 12'). To these observations, Eratosthenes applied certain "known" facts (1) that on the day of the summer solstice, the midday sun was directly over the line of the summer Tropic Zone (Tropic of Cancer)-Syene was therefore concluded to be on this line; (2) the linear distance between Alexandria and Syene was 500 miles; (3) Alexandria and Syene lay on a direct northsouth line. From these observations and "known" facts, Eratosthenes concluded that, since the angular deviation of the sun from the vertical at Alexandria was also the angle of the subtended arc, the linear distance between Alexandria and Syene was 1/50 of the circumference of the earth or 50 x 500 = 25,000 miles. A currently accepted value for the earth's circumference at the Equator is 24,901 miles, based upon the equatorial radius of the World Geodetic System (Chapter VIII). The actual unit of measure used by Eratosthenes was called the "stadia." No one knows for sure what the stadia that he used is in today's units. The measurements given above in miles were derived using one stadia equal to one-tenth statute mile. It is remarkable that such accuracy was obtained in view of the fact that most of the "known" facts and his observations were incorrect: (1) although it is true that the sun at noon is directly overhead at the Tropic of Cancer on the day of the summer solstice, it was erroneously concluded that Syene lay on the line. Actually, Syene is 37 miles to the north; (2) the true distance between Alexandria and Syene is 453 miles and not 500; (3) Syene lies 3� 30' east of the meridian of Alexandria; (4) the difference of latitude between Alexandria and Syene is 7� 5' rather than 7� 12' as Eratosthenes had concluded. Another ancient measurement of the size of the earth was made by the Greek, Posidonius. He noted that a certain star was hidden from view in most parts of Greece but that it just grazed the horizon at Rhodes. Posidonius measured the elevation of the same star at Alexandria and determined that the angle was 1/48th of circle. Assuming the distance from Alexandria to Rhodes to be 500 miles, he computed the circumference of the earth as 24,000 miles. While both his measurements were approximations when combined, one error compensated for another and he achieved a fairly accurate result. nsminc I have seen something similar to this one!!! but one that looks like the English cross or more complex, discoverd by some one studing satalite images of Hellas. I need to look for it I beleive I may still have this magazine? Perhaps a whole new topic can be created about that??? This section . . .
For since it [the delta of the Nile River] is alluvial soil and well watered, it produces many crops of every kind, inasmuch as the river by its annual rise regularly deposits on it fresh slime, and the inhabitants easily irrigate its whole area by means of a contrivance which was invented by Archimedes of Syracuse and is called, after its shape, a screw.
. . . and what is the most surprising thing of all, they [Roman slaves] draw out the water of the streams they encounter [in Spanish mines] by means of what is called by men the Egyptian screw, which was invented by Archimedes of Syracuse at the time of his visit to Egypt; and by the use of such screws they carry the water in successive lifts as far as the entrance, drying up in this way the spot where they are digging and making it well suited to the furtherance of their operations. Since this machine is an exceptionally ingenious device, an enormous amount of water is thrown out, to one's astonishment, by means of a trifling amount of labour, and all the water from such rivers is brought up easily and from the depths and poured out on the surface. And a man may well marvel at the inventiveness of the craftsman [Archimedes], in connection not only with this invention but with many other greater ones as well, the fame of which has encompassed the entire inhabited world . . Translation by C. H. Oldfather in Diodorus Siculus, Library of History, Volume III, Loeb Classical Library, Harvard University Press, Cambridge, 1939. The bilge-water [of the ship Syracusia], even when it became very deep, could easily be pumped out by one man with the aid of the screw, an invention of Archimedes. Leonhard Euler (1707-1783), The Fourteen "Quaestiones Mathematicae"
1. A theory is sought for the rising of water by the screw of Archimedes. Even if this machine is used most frequently, still its theory is desired. 1. There is also the method of the screw, which raises a great quantity of water, but does not carry it as high as does the wheel. The method of constructing it is as follows. A beam is selected, the thickness of which in digits is equivalent to its length in feet [16 digits = 1 foot]. This is made perfectly round. The ends are to be divided off on their circumference with the compass into eight parts, by quadrants and octants, and let the lines be so placed that, if the beam is laid in a horizontal position, the lines on the two ends may perfectly correspond with each other, and intervals of the size of one eighth part of the circumference of the beam may be laid off on the length of it. Then, placing the beam in a horizontal position, let perfectly straight lines be drawn from one end to the other. So the intervals will be equal in the directions both of the periphery and of the length. Where the lines are drawn along the length, the cutting circles will make intersections, and definite points at the intersections. 2. When these lines have been correctly drawn, a slender withe of willow, or a straight piece cut from the agnus castus tree, is taken, smeared with liquid pitch, and fastened at the first point of intersection. Then it is carried across obliquely to the succeeding intersections of longitudinal lines and circles, and as it advances, passing each of the points in due order and winding round, it is fastened at each intersection; and so, withdrawing from the first to the eighth point, it reaches and is fastened to the line to which its first part was fastened. Thus it makes as much progress in its longitudinal advance to the eighth point as in its oblique advance over eight points. In the same manner, withes for the eight divisions of the diameter, fastened obliquely at the intersections on the entire longitudinal and peripheral surface, make spiral channels which naturally look just like those of a snail shell. 3. Other withes are fastened on the line of the first, and on these still others, all smeared with liquid pitch, and built up until the total diameter is equal to one eighth of the length. These are covered and surrounded with boards, fastened on to protect the spiral. Then these boards are soaked with pitch, and bound together with strips of iron, so that they may not be separated by the pressure of the water. The ends of the shaft are covered with iron. To the right and left of the screw are beams, with crosspieces fastening them together at both ends. In these crosspieces are holes sheathed with iron, and into them pivots are introduced, and thus the screw is turned by the treading of men. 4. It is to be set up at the inclination corresponding to that which is produced in drawing the Pythagorean right-angled triangle: that is, let its length be divided into five parts; let three of them denote the height of the head of the screw; thus the distance from the base of the perpendicular to the nozzle of the screw at the bottom will be equal to four of those parts. A figure showing how this ought to be has been drawn at the end of the book, right on the back. I have now described as clearly as I could, to make them better known, the principles on which wooden engines for raising water are constructed, and how they get their motion so that they may be of unlimited usefulness through their revolutions. This is a very informative topic, congratulations No 1 Wog. One thing that has captured my curiosity is the Parabolic mirror, I know that this method is used to ignite the Olympic torch at the begining of the torch relay. But I've heard of a mirror tower used in ancient Greece which was harnessed as a weapon in order to burn ships over a large distance. Is this weapon fact or fiction? A parabolic mirror is a mirror which resembles a bowl, but if it's faced at a light source the light rays will always pass through it's focus point. This means that if you place an object in that focus point, the sunlight hitting the point will ignite the object. This is how the Olympic torch is lit every time the torch relay starts in Olympia. This same principle works with sound waves too. If a parabolic 'bowl' is constructed and a microphone is placed in the focus point, more sound waves bounce of the parabola and hit the microphone thus amplifying the sound even more. I can't believe the ancient Greeks knew all about that. Where was the rest of the world when this was being developed and researched in Greece? Thank you very much this thread is doing to be used to add more information please don't be afraid to add anything any information will be useful. This machine for raising water, allegedly invented by the ancient Greek scientist Archimedes for removing water from the hold of a large ship. One form consists of a circular pipe enclosing a helix and inclined at an angle of about 45 degrees to the horizontal with its lower end dipped in the water; rotation of the device causes the water to rise in the pipe. Other forms consist of a helix revolving in a fixed cylinder or a helical tube wound around a shaft. Modern screw pumps, consisting of helices rotating in open inclined troughs, are effective for pumping sewage in wastewater treatment plants. The open troughs and the design of the screws permit the passage of debris without clogging. Other inventions of Archimedes such as the compound pulley also brought him great fame among his contemporaries. Archimedes had stated in a letter to King Hieron that given the force, any given weight might be moved, and even boasted, we are told, relying on the strength of demonstration, that if there were another earth, by going into it he could remove this. Hiero being struck with amazement at this, and entreating him to make good this problem by actual experiment, and show some great weight moved by a small engine, he fixed accordingly upon a ship of burden out of the king's arsenal, which could not be drawn out of the dock without great labor and many men; and, loading her with many passengers and a full freight, sitting himself the while far off, with no great endeavor, but only holding the head of the pulley in his hand and drawing the cords by degrees, he drew the ship in a straight line, as smoothly and evenly as if she had been in the sea. "Give me a place to stand and rest my lever on, and I can move the Earth." Archimedes discovered pi. The mathematical constant � represents the ratio of a circle's circumference to its diameter and is commonly used in mathematics, physics, and engineering. Pi is the lowercase Greek letter equivalent to "p" in the Roman alphabet; its name is "pi" (pronounced pie), and this spelling can be used when the Greek letter is not available. He performed numerous geometric proofs using the rigid geometric formalism outlined by Euclid, excelling especially at computing areas and volumes using the method of exhaustion. Archimedes, although he achieved fame by his mechanical inventions, believed that pure mathematics was the only worthy pursuit. He was a brilliant mathematician who helped develop the science of geometry. His methods anticipated the integral calculus 2,000 years before Newton and Leibniz. Although many solid figures having all kinds of surfaces can be conceived, those which appear to be regularly formed are most deserving of attention. Those include not only the five figures found in the godlike Plato, that is, the tetrahedron and the cube, the octahedron and the dodecahedron, and fifthly the icosahedron, but also the solids, thirteen in number, which were discovered by Archimedes and are contained by equilateral and equiangular, but not similar, polygons.